In the Fulton Mall in downtown Flatbush there is a wall that has been put up around an abandon building. But when you actually look at the wall you see writing on it. 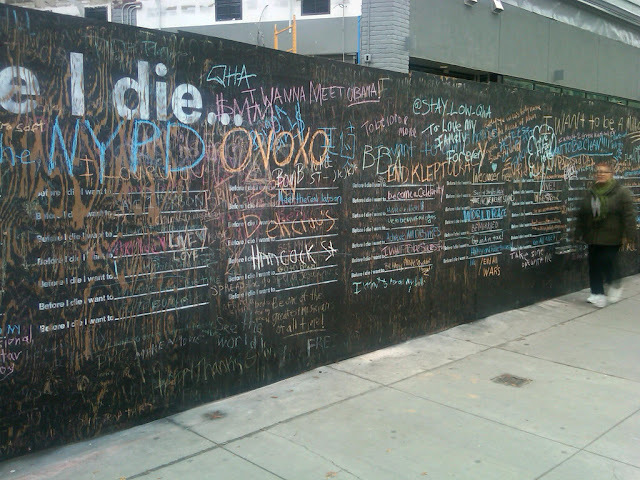 At first you think graffiti, but when you actually look at what’s written you notice the phrase “Before I die”. And underneath that phrase were the words of random people wrote their hopes and dreams on that same wall. Anyone can write something that they would like to do before they die no matter how silly or serious, no censorship. Chalk is made available and is waiting for anyone to write their thoughts, dreams, and desires down. This isn’t the first wall to be done. In New Orleans, LA, the creator behind this, Candy Chang, got some friends together and stenciled a wall with the sentence: “Before I die I want to….” where residents can write on the wall and remember what is important to them. The reaction was such a positive reaction that more and more people in various cities also wanted to have their own wall. Such a simple project turned into such a major phenomenon that a tool kit was also made for anyone that wanted to create their own wall. You can purchase the tool kit here: http://civiccenter.cc/the-before-i-die-toolkit/. For anyone who doesn’t have a wall near by you can go online and write what you would like to do there: http://beforeidie.cc/dreams/.